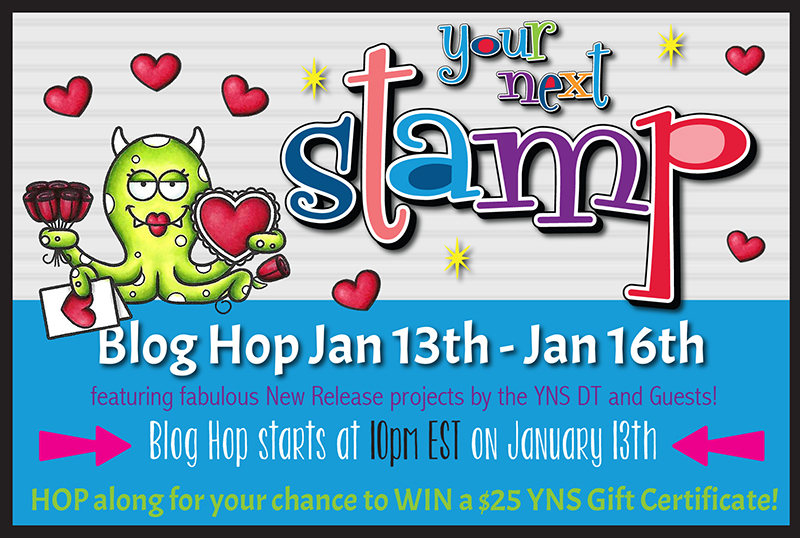 Hollybeary Creations : YNS January Release Hop!!! It's time for the new release from Your Next Stamp!!! This release is Full of everything you need to create projects for the special someone. All the products are now available in the shop as well. Hop along and leave comments for a chance to win a $25 Gift Certificate to the store. 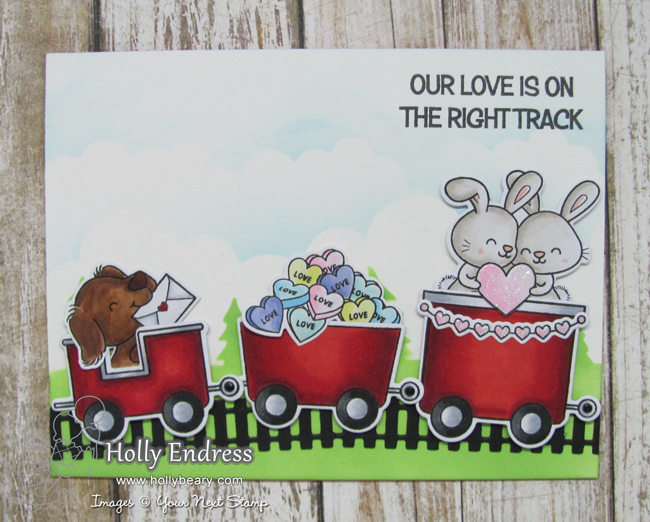 My first project using the new All Aboard Love Train stamp and coordinating die sets. This set is a perfect companion for All Aboard & All Aboard Train Carts sets. I created the background with some Blue Curacao and Garden Green inks and a blending tool. I created my own stencils with the Puffy Cloud Border Die set and the Evergreen Tree Border Die. Then I adhered the panel to a A2 size card base. I stamped all the images using YNS Black Olive ink on some X-Press It Blending card stock and colored them with Copics. I used the coordinating dies to cut the images out. 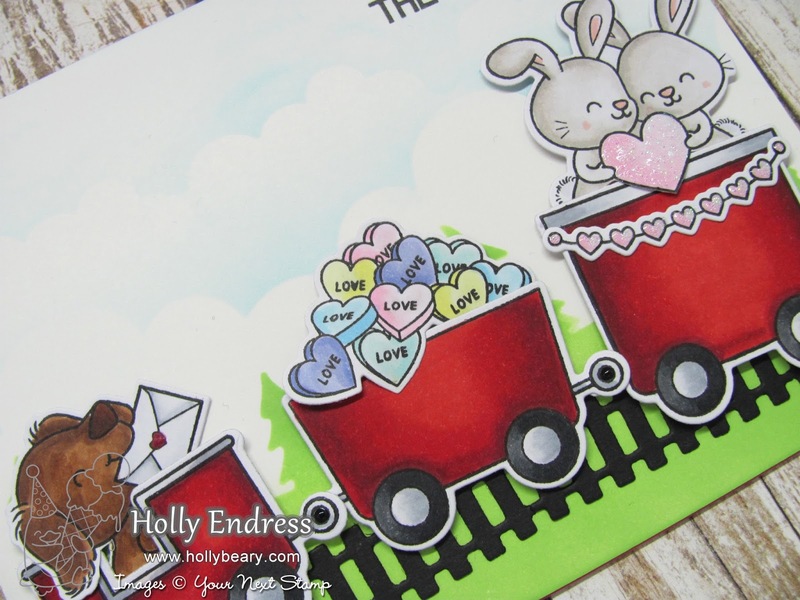 I wanted a little sparkle on the images so I added some Clear Glitter Nuvo Drops and some Red and Black drops as well to the Train carts and the envelope. My second card features the new Cat Bookmark die set and the coordinating Animal Bookmark Add-on set. I created a background on a piece of watercolor paper with some Sunflower Yellow and Garden Green YNS inks and a blending tool. Then I die cut the panel with the Stitched Scallop Rectangles Die set. I stamped the sentiment from the new What Not Sentiments Eleven Set in Black ink and adhered the panel to a White card base. I Die cut some balloons (non-YNS) and adhered them in the upper corner and added some details with a White Gel pen. I added some twine to connect the balloons with the bear as well. All of the die cut pieces have some shading in coordinating colors of ink. Are you ready to Hop along for a Chance to Win a $25 GC to the store and see all the amazing new products in the release? Soooo cute! I absolutely love the little bear holding the balloons! Also, how cute is that little train full of critters! EEEEEK - these cards are both so flippin' cute! I love that the bear has the balloons tied to his wrist like a little kid--so cute! Gorgeous coloring on the little train cards Holly! The love train is so sweet. awwwww! that train scene if super adorable! OMG, Holly, the first card is just perfection! So cute, colored gorgeously. And of course that bear is sweet; love the way you made him hold the balloons. Well I LOVE your love train!! And I love the bright colors you used on your Birthday Card! Great coloring on the cute train scene and love the bear with the balloons. OMGoodness, the cuteness! Love both of your cards! The bookmark die is a must-have! I love the Love Train!!! Super Cute cards!! Love the Birthday one with the bookmark. Nice job ! Such cute cards! I love the bookmark sets! These are both so super cute, love the train of hearts. The bunnies are adorable, especially when you put them in the train. Love that card! Both cards are super sweet, Holly! Thanks for the inspiration. I like all the cute little critters! 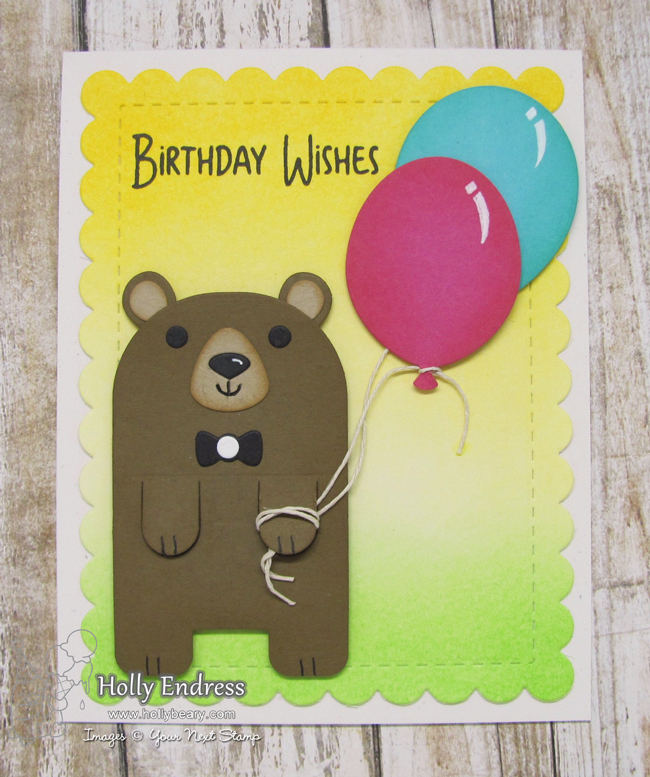 The bear die is especially sweet with those balloons. Holly, I just adore your sweet cards! The coloring is fabulous, and I love all the details like the soft sky and touches of sparkle! Oh my, those are such cute cards! These are both adorable!!! Love that super cute train on the first. The balloons are wonderful! They match up perfectly with the bear and are such an easy way to make it festive. Such fun and adorable cards!! Beautiful work!! So darling. That sentiment that stamp set, perfection. Aww, beautiful cards! Love everything about them. Gorgeous cards, super colours and love the delicate images. Very cute cards! Live the sweet train images. Super sweet cards!!! I love the train packed with cuteness!!! 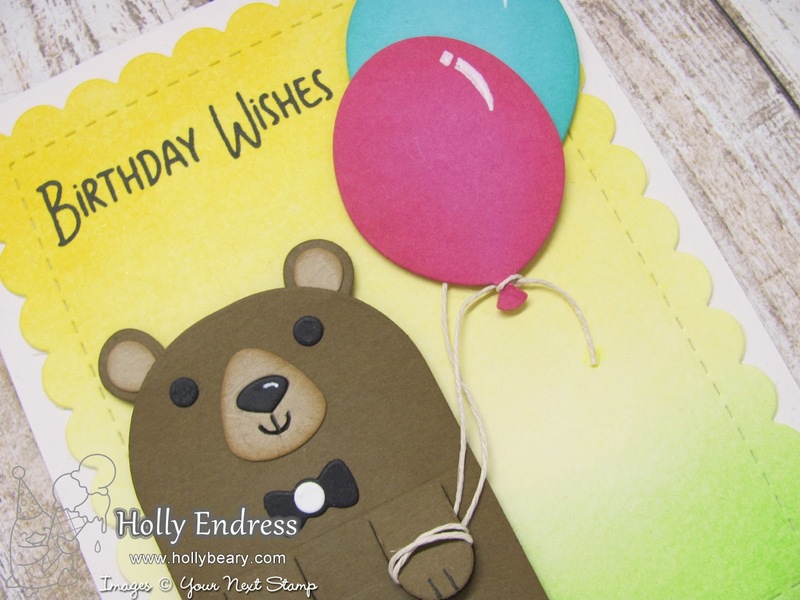 Your bear makes a great birthday card!! super sweet cards, there are adorable! Omygosh! They are both adorable! But I really like the little train cars! Super cute! oh so very adorable cards!